I love living in a place where the people who I trade with on a daily basis will take time to understand my needs and have the expertise to help me. Not too long ago, I saw something online that sparked my creativity and gave me a great idea for a weekend project, but it was definitely not something I could buy off of a shelf. After doing more research, I headed to a local store that I thought I could buy the supplies for, but it must have been my puzzled look as I turned my sketchpad over that got the owner’s attention. The owner spent about 45 minutes with me, my sketch pad and my idea. I patiently waited as other customers came in and the owner saw to their needs and came back to me to pick up where we left off. I walked out of the store with everything I needed and an understanding of how to accomplish my project. I have never forgotten that experience and now trade with that business when needed. If I get busy and forget about refilling my prescription, I know I can call the local pharmacy and they will reach out to my local physician, if necessary, to get me taken care of. If I need an outfit for a certain event, I can call our retail shops and give them some general information on my plans, they will take the time to have a few recommendations for me to try by the end of the day. For this busy mom, experiences like this are priceless!! The relationships we build in our community are valuable. When you trade locally, you are a person, not just a number. It's not a transactional trade, it's a purposeful trade. That trade allows local owners to grow, support and in turn give back, just like you. Supporting our local businesses keeps our economy growing which enables Forsyth and Monroe County to continue to prosper. Stop for a moment and think about all the services you receive for your business, organization or home. Are those providers from our local community? If not, does someone local offer those same services or items? Then ask yourself why you utilize the businesses you do. Is it cost effective? Habit? Relationship? What if we shifted that mindset to support local businesses to further support ourselves? When our community grows, new businesses start or relocate, our taxes are directly affected. How many of us are grateful that our taxes are not of the same caliber as some of our surrounding neighbors? If we think our purchases through to the big picture, it makes perfect sense to support where we live, work and play. With the shopping season upon us. Many local options are available, from gift certificates for services to items in the retail stores. Stop in to the local businesses, see what they have to offer. Do your grandchildren like dance classes? Would you like to find the perfect gift for that special someone? 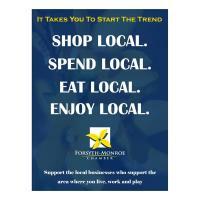 Check out our website https://www.forsyth-monroechamber.com/list/ and trade locally. Local business owners truly appreciate their own community supporting them. So, go out and make those relationships! You are not just a number.